Published: May 2, 2014 at 03:24 p.m. 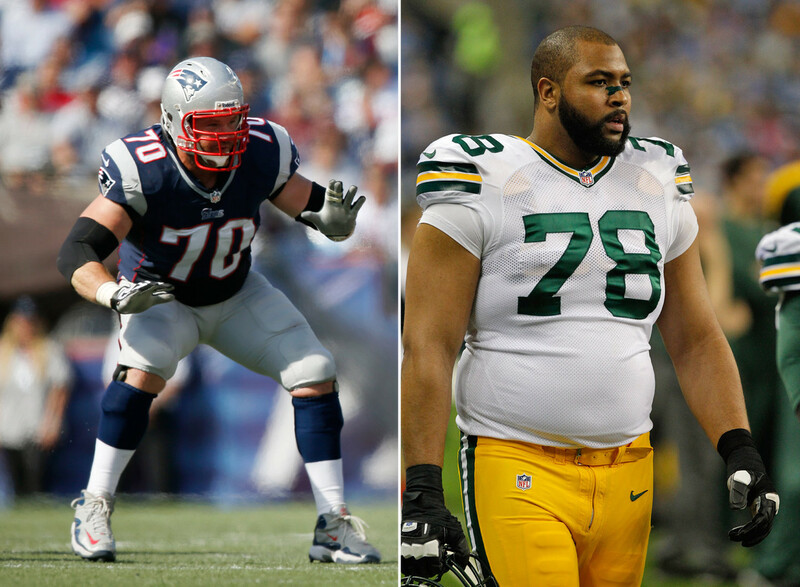 Updated: May 2, 2014 at 04:33 p.m.
One of the premiere guards in the league, Mankins has been the Patriots' most stable lineman. He's started 130 games in nine seasons and is a six-time Pro Bowler and five-time All-Pro. Drafted to protect Aaron Rodgers, Sherrod has played in only 12 games in two years (zero starts) and missed all of 2012 with an injury. Olsen is as sure-handed as you'll find at the tight end position and has been a big target for Jay Cutler and Cam Newton. He's averaged 55 catches and five touchdowns in his seven seasons. Woods played in 14 games his rookie season, garnering only seven receptions for 160 yards and a touchdown. He was never heard from again. A two-time Pro Bowl player, Miller has been Ben Roethlisberger's safety valve for years. He's averaged more than 50 catches and four touchdowns in his nine seasons. Jenkins has eight career receptions in 19 games. Below pedestrian. No center in the last decade has been as durable and dependable as Mangold. He's started all 126 games in his eight seasons and is a five-time Pro Bowler and two-time All Pro. Balmer failed to record a sack and only started 11 games in five seasons. Staley has started all 98 games he has played in during his seven-year career, including every game the last three seasons. A three-time Pro Bowler, he's the protector of Colin Kaepernick's blind side. An inconsistent starter in Seattle, Jackson was a solid sub for three seasons with the Lions before flaming out with 19 career sacks. White has been a stellar NFL receiver. A five-time Pro Bowler and an All-Pro, he had a streak of six consecutive 1,000-yard seasons and even led the league in receptions (115) in 2010. It took Smith three seasons to become a starter in Baltimore but you want a first-round corner to have more than four interceptions in three years. Matthews has missed a handful of games in recent years but otherwise he's been one of the most feared and consistent pass rushers in the NFL. A four-time Pro Bowler and an All-Pro, Matthews has 50 career sacks in five seasons with Green Bay. McCargo has just one career start in six seasons and only a couple of sacks. That's rough for a first-round pick, regardless of an injury-riddled career. Beason was a monster his first four seasons in the league with Carolina. He started all 64 games, averaged more than 100 tackles per season, made three Pro Bowls and was named to the All-Pro team once. Injuries have cost him some of his productivity of late but he's still a respectable player for the Giants. Carroll played well his first two years in the league, but ultimately has started just 28 games in five seasons with three career interceptions. Rodgers' credentials speak for themselves: Super Bowl winner, league MVP, three-time Pro Bowler, All-Pro, 58 wins in six years as a starter, commercial pitchman. Jerry started just 15 games in four seasons and registered two sacks before bouncing back in 2013 with 14 starts and 3.5 sacks. Despite never playing with a top-level quarterback, Bowe has put up solid numbers in his seven seasons and at times has shown he's capable of being a premiere receiver. The former Canadian firefighter started 12 games his rookie season but has only started six in the last two. Thomas exploded onto the scene as an elite pass-catcher when Peyton Manning arrived in Denver. Two 90--plus-catch, 1,400-plus-yard seasons later, No. 88 is a two-time Pro Bowler and a feared NFL receiver who's only getting better. Quinn is just 4-16 in his career as a starter and has better biceps than deep ball. The Heavy Chevy is what you call a run-stopper, and has been among the best in the league at doing so during his 10-year career. A five-time Pro Bowler and once an All-Pro, Wilfork's value was seen last season when New England's run defense was non-existent after his year-ending injury. High hopes heading into the league after playing quarterback in college, Jones started just 15 games in his four years and couldn't escape substance-abuse problems. A three-time Pro Bowler, Hali has missed only three games in eight seasons. Durable, reliable, and fearless, he's sacked NFL quarterbacks 46.5 times in the last four years and is one of the game's premier pass rushers. Udeze had just 11 sacks in four seasons before his career was cut short by leukemia, . Cromartie has been a very good NFL corner, being named a Pro Bowler three times and once an All-Pro. His 28 career interceptions place him 10th on the active list. After a successful rookie season in which he started 12 games, Otah caught the injury bug and started just 17 more in his short career. He missed all of 2010 due to injury. When you tell your owner, "Nah, I'm good" on signing a contract extension, then you go out and win the Super Bowl and sign a fresh $100 million deal, you're a Rock Star. It also helps to be 28 games over .500 for your career as a starter and 9-4 in the playoffs. James played just one full season (his first) and had five sacks in four seasons. His career was cut short by injury and an indefinite suspension by the league. Before the wheels inexplicably fell off in 2013, Freeman was a big-time NFL quarterback with a 10-win and 4,000-yard season under his belt. He looked on his way to becoming one of the bright young stars in the league. We'll see if he can regain that shine. Pollack started just 6 of 16 games over two seasons and recorded 4.5 sacks before a neck injury cut short his career. DRC made the Pro Bowl as a rookie after a six-interception rookie season with the Cardinals, and has been steady throughout his six NFL years. His 19 career picks and more than 100 pass breakups make him still one of the league's top corners. Harrell could never stay on the field for the Packers. He played in just 14 games in three seasons and missed all of 2009 with an injury. Johnson has been as steady as they come in nine seasons with the Chiefs. A three-time Pro Bowler and once an All-Pro, he has 376 tackles in the last three years for a strong Kansas City defense. Hill played only one full season (his first) in five years in the league and registered five career interceptions. Fourteen is the draft slot for top defensive talent. Revis, a five-time Pro Bowler and three-time All-Pro, is widely considered the best cornerback of his generation, and renders half the field unusable whenever he's healthy. His 21 career interceptions seem low, but when no one throws your way out of fear, it's hard to pick anything off. Inconsistent in his seven-year career, Williams has only been able to log three full seasons. A three-time Pro Bowl player, Orakpo missed nearly all of 2012 and bounced back with 10 sacks last season to push his career total to 39.5. A feared edge rusher, he's among the game's best when at full strength. Philadelphia traded up to get the Michigan standout and it hasn't exactly paid dividends. Graham has started just 12 games in four seasons and has registered 11.5 sacks. Ngata has been the best defensive tackle in the game for several years now. Incredibly consistent and durable, he's missed just five games in eight seasons, not to mention he's a five-time Pro Bowler and two-time All-Pro pick. Another quarterback bust from 2011, Ponder had moments of competence but hasn't lived up to his first-round draft selection. He does have more touchdowns (38) than interceptions (34), which is more than some can say. This is far and away the most loaded of the first-round draft slots with four potential Hall of Famers taken here in the last decade. But when you play in a quarterback-driven league, and you're a quarterback who's won two Super Bowls (and played in another), you're the Rock Star of this group. Heralded as the next Bruce Smith when drafted, Maybin finished with six career sacks in four seasons. They all came in 2011. A two-time Pro Bowl player and once All-Pro selection, Mayo is the unquestioned leader of a consistently stout Patriots defense. His presence was clearly missed after going down in Week 6 of 2013 and missing the rest of the season. Can you believe that before the 2011 draft there was talk of Gabbert going first overall? This was a real discussion. Gabbert is 5-22 as a starter with just a 53.3 completion percentage. Great hair, though. Only two years into the league, Kuechly is a bona fide rock star at the linebacker position. He has 200 tackles in two seasons, and was Defensive Rookie of the Year and then Defensive Player of the Year. It might be early to declare Milliner a bust, but when you're labeled as the next island inhabitant, anything less is falling coconuts. Say what you will about Hall, and plenty have, he's produced in all three of his NFL stops. His 43 career interceptions rank fifth among active players. Harvey played just three full seasons, garnering eight sacks. He never lived up to the lofty expectations which surrounded him on draft day. The most violent runner since Jim Brown, AD finished 8 yards shy in 2012 of breaking the all-time single-season rushing record. Not to mention him topping 1,250 yards rushing in six of his seven seasons, to go along with three All-Pro selections. Williamson played just one full year in five NFL seasons, registering only 37 catches in it. He finished with four career touchdowns. Davis entered the league with the body of an Adonis, and the hype to match, and he's done nothing but live up to the immense expectations. Feared, explosive, Davis is a two-time Pro Bowler and scored 13 touchdowns two separate times in his eight-year career. One of the biggest defensive busts overall of the last decade, Gholston registered zero career sacks during his three seasons with the Jets. In just three short seasons Peterson is already one of the most explosive and dynamic defensive players in football. Throw in his return-game versatility (he even played a little offense in 2013) and it's easy to see why he's in this position. Cam Newton went first overall in 2011, but an argument could be made for Peterson as the best player in that draft. Remember the hype on Dorsey coming into the 2008 draft? Much more was expected than six sacks in 78 career starts. Mr. Bolo Tie has been one of the grittiest quarterbacks in the league during his tenure, earning five Pro Bowl selections, having 79 wins as a starter, and throwing 221 touchdown passes. Tough, hard-nosed and always willing to do whatever it takes for his team, Rivers is the undeniable face of the Chargers. Curry registered just 5.5 sacks in his first two seasons and zero in his third. He was out of the league by 2012. Eight Pro Bowls and six seasons of 1,000-plus receiving yards despite playing with JV quarterbacks most of his career. His 64-yard touchdown in Super Bowl XLVIII should have won the game if not for a crazy Steelers comeback, too. Pass rushers are key but with only nine career sacks in five seasons, despite 55 starts, isn't going to cut it. Plus, it's a tad too early to announce Marcel Dareus, Dion Jordan or even Trent Richardson -- all No. 3 picks -- as busts. If you need to know why Megatron is the best second pick of the last decade, put on the tape of the 2013 Cowboys game in which he had 14 catches for 329 yards and a touchdown. Throw in four Pro Bowls and three All-Pro selections and he's headed for a Hall of Fame career. Linemen selected with the second overall pick should start more than 26 games in four seasons. Even Robert Gallery made it eight years and started 103 games in that span. When you're 22-10 in two years with a nearly 2:1 touchdown-to-interception ratio, with 600-plus rushing yards and nine touchdowns, yeah, you're a rock star. Sure, he's the most infamous of the recent top picks, but Russell was downright bad. Seven wins, 52 percent completion percentage and only 18 touchdowns in three seasons, and he weighed more than his left tackle.